,Chopra, Mallika and Brenna Vaughan. Just Breathe: Meditation, Mindfulness, Movement, and More. New York: Running Press Kids, 2018. ISBN 978-0-7624-9158-2; Paperback; US $12.99, CAN $16.99. First off, I will admit that I am not the biggest fan of Deepak Chopra's pseudo-scientific "wellness" empire (and I've read most of his books and also taken his Primordial Sound Meditation course, so this is not a rash judgement). My bias going into this book written by his daughter was that I wasn't going to like it. While none of the exercises or techniques in this book were new to me (having read hundreds of books on the topic) they are all presented in a refreshing way and with a gentle, loving voice that felt very authentic. It felt like I was talking with a nurturing mom who wanted to help me calm down before a test or lull me to sleep at night. And this makes sense, as Mallika Chopra IS a mother of two daughters and she claims to have written this book first by consulting with them (and her nephew) and also for them and their peers. It shows. The language is clear, accessible, and best of all, not patronizing. The illustrations by Vaughan are modern, inclusive, and highly relatable for any child or teen. Besides meditation and mindfulness exercises there are also simple yoga poses with easy-to-follow instructions and samples. I like how the exercises correspond with real-world scenarios kids will experience, such as feeling angry, being in pain, or having a headache. Chopra doesn't avoid the tough topics: "Life can be hard. People you love can hurt you." She goes on to describe how we need to get quiet enough to be able to make decisions that are right for us, not out of fear, but out of self-care. I would recommend this book for juvenile/YA circulating collections. One issue is that Mallika sends readers to www.intent.com for more resources, but that doesn't appear to be the correct website. You should go to ​intentblog.com instead. Gates, Miriam and Margarita Surnaite. Meditate with Me: A Step-by-Step Mindfulness Journey. New York: Dial Books, 2017. ISBN 978-0-399-18661-5; Hardcover; US $17.99. Want to teach meditation to kids ages 5-10? Even if you’ve never done a moment of meditation before in your life? Read this book with the kids and have them make “glitter bottles” out of recycled bottles with glitter, water, and food coloring, just like in the story. Another craft idea is to have them paste cotton balls on a blue paper sky to make the “thought clouds”. They can add lightening or sunshine or whatever else they might be feeling that day. The book features adorable animals learning how to be aware of their breath, their feelings, and the world around them. There is a 4-step meditation process included at the end of the book, which parents and teacher may also find helpful. Gates, Rolf and Katrina Kenison. Meditations from the Mat: Daily Reflections on the Path of Yoga. New York: Anchor Books, 2002. ISBN 978-0-385-72154-7; Paperback; US $15.95, CAN $21.00. I often lend this book to friends and students who are looking to learn more about yoga, mindfulness, and meditation, but are overwhelmed by too much dogma and jargon. Written by a reformed exercise-junkie, recovering alcoholic and ex-soldier, Gates approaches yoga and meditation from a realistic, down-to-earth perspective. He understands that showing up on the mat every day sometimes feels impossible. The book is sectioned into 365 bite-size blurbs which are appealing for both their directness and their succinctness, and make great opening or closing remarks for an adult yoga class. Here's a good example: "Even in the bloom of our new passion [yoga], we realize there are still grave problems at work or at home. Liberated from our obsessive thinking, we discover the depression, grief, or pain that was hidden underneath. As our spines become increasingly flexible, we begin to understand the extent of the physical consequences of decades of compensating for a bad back. Then we embark on a period of reconstruction. And this is where the real work begins" (143). A good addition to any public or professional collection and useful across multiple disciplines and programs. Goldsaito, Katrina and Julian Kuo. The Sound of Silence. New York: Hatchette, 2016. ISBN 978-0-316-20337-1; Hardcover; US $18.99, CAN $24.99. On the way to school Yoshio hears the ethereal sounds of a koto being tuned. He stops to speak with the musician and asks her to describe her favorite sound. She says, ma, the sound of silence. So Yoshio goes on a quest to the bamboo fields, the busy city, the bathtub, the dining room, his sleeping house, the park, and eventually his school in the early morning hours to try to find this elusive silence. He discovers it has been with him all along, inside, and between all the noise and busy-ness. This beautifully illustrated book is a delightful introduction to mindfulness for small children and includes an interesting afterword for grownups. Highly recommended for storytime programming and juvenile collections. Hannaford, Carla. Playing in the Unified Field: Raising & Becoming Conscious, Creative Human Beings. Salt Lake City: Great River Books, 2010. ISBN 978-0-915556-39-7; Paperback; US $16.95. Biologist, educator and visionary, Dr. Hannaford has been studying the mind-body connection for the last 40 years, building on the work of her mentor, Dr. William Tiller. This book begins from the premise that all humans are born to exist in "vibrational coherence," a state of non-stress, and that our frantic, harried pace of life in the 21st century, combined with a cultural legacy of neglect, abuse, disconnection, and puritanism is causing us to frequently act incoherent, or under a constant state of stress. Hannaford highlights the importance of free play, nature, music, dance, yoga and other mindfulness-based practices to reintegrate our senses, bring us back to the present moment, and form a caring community that can offer support and sense of belonging. With the current epidemic of anxiety-ridden and depressed adults and children, libraries should be doing everything they can to reach out to new members, host wellness initiatives and encourage community involvement. This fascinating read offers inspiration and solid scientific evidence for creating yoga and meditation programs in libraries and schools everywhere. Highly recommended. Hirschi, Gertrud. Mudras: Yoga in Your Hands. York Beach, ME: Samuel Weiser, 2000. Print. ISBN 978-1-578631-39-1; Paperback; CAN $19.50. Mudras are locks or seals, and in yoga are often done with the hands while seated, lying down, standing and walking. Not to be confined just to the yoga class, they are also helpful during waiting times, periods that are normally filled with aggravation. Mudras are great to help kids (and adults) with self control, along with a program of breathing exercises, visualization and grounding affirmations. They are especially helpful for kids with special needs. Hirschi's fascinating book gives detailed instruction and helpful images to teach a variety of hand mudras, such as "Garuda Mudra," "Varuna Mudra," and "Tse Mudra." Includes diagrams of acupressure points in the hands and the importance of color in our environment. A fascinating read; incorporating mudras makes an interesting addition to yoga and meditation programs for all ages. Ortner, Nick and Alison Taylor. My Magic Breath: Finding Calm Through Mindful Breathing. New York: HarperCollins, 2018. ISBN 978-0-062687-76-0; Hardcover; US $17.99. This cute, colorful book is a decent way to introduce the concept of meditation to preschoolers or early elementary students. Throughout the book, which asks readers to blow along with their "magic breath," the breath of the children in the story changes depending on how they feel or what they are thinking. Sad thoughts are blue-green, happy thoughts are red-yellow-orange. When we are busy or worried or our day is very full, sometimes all the thoughts and their colors mix together. The authors urge us to blow away our thoughts so that by the end of the day we can be sleepy and YAWN and give our "magic breath" a rest. For some reason this book irked me slightly, I think maybe the idea of telling kids they can just "blow their sad thoughts away" seems not only overly simplistic, but also untrue. Meditation and mindfulness doesn't make thoughts or feelings go away, it only asks us to acknowledge them and watch them and accept that they will eventually change. So while I would still recommend this book for juvenile collections, know that it isn't the best on the market. I would first recommend Meditate with Me (see above) for this age group if I had to choose one to use for a program. Pearce, Joseph C. Magical Child. 1977. New York, N.Y., U.S.A: Plume, 1992. ISBN 978-0-452-26789-3; Paperback; US $16.00, CAN $17.50. Of all the books on developmental psychology I have read and could recommend, why do I still go back to this classic by Joseph Chilton Pearce written decades ago? Because Magical Child, even with its hippie aura, NAILS it. Our goal, as parents, librarians, educators and guides, is to lead the children in our care towards both autonomy and connection. We must teach them there are three safe grounds on which to stand: the Earth, trusting relationships, and their own power of thought. Intelligence, Pearce maintains, can only grow by moving from the known to the unknown. Children need a safe base to venture out from and from which they can always return. We see that every day in our libraries with emergent readers who may test the waters by taking home a book we suggest that's slightly more difficult or a different genre than they are used to, but continuing to love reading at their level or a familiar series while they build their confidence and try new things. An excellent resource to help understand the importance of multimodal learning and honoring the whole child in our programming sessions. Sadhguru, Jaggi Vasudev. Inner Engineering: A Yogi's Guide to Joy. New York: Spiegel & Grau, 2016. ISBN 978-0-8129-9779-8; Hardcover; US $25.00; CAN $34.00. Confession: I had this book checked out of the library for more than six months. Ok, eight months. Luckily no one had it on hold. It wasn't because it was boring or tedious and I just couldn't get through it, though some of the ideas are dense and need to be parsed from multiple angles. It was rather that there were so many mind-puzzles to mine from it that a single read-through was too superficial for my taste. This is not to say it is a perfect book, nor Sadhguru a flawless teacher with no personal agenda, despite his charm. The author and his Isha Foundation have been mired in controversy (including being accused of murdering his wife, so not just a little controversy). His writing is didactic, and at times even feels a little patronizing. There's also a whole lot of junk "science" in it. So why read the book at all? And why add it to your library's collection? Why support another potential despot? Don't we have enough authors like this already? For example: Osho - who posits that homosexuality is an immature form of love. Well, for one, yogic philosophy is a hot topic that isn't going away any time soon (though the fact that there wasn't a huge demand for the book while I had it checked out may indicate otherwise). And it IS a NYT bestseller, so clearly I'm not the only one interested in reading it. Also, as public libraries, it is important for us to offer a variety of perspectives, even if we personally might think those perspectives are crazy, skewed, or possibly even dangerous (not that I am saying that about this book, just in general). The book basically centers around the author's life story and how he used the physical yoga asanas as a path towards enlightenment and then branches out into how you can apply these teachings in your own life, which he illustrates by using parables and prescriptive meditation exercises. Personally, I found the book to be about 70% posturing hogwash and 30% thought-provoking kernels of wisdom. But I'm also of the bent that even psychopaths might have something to teach us (even if it is just "don't be a psychopath.") Also, as a yoga teacher who regularly gets asked about yoga books, I felt I had a duty to give it its fair due. I mean, some of his teachings are the same insights I'm peddling (though to much less acclaim, financial reward - and thankfully - murder accusations). So, I'm clearly coming at this from a biased perspective and can't really objectively offer a recommendation, other than I think public libraries should carry multiple perspectives that appeal to a wide audience. Whether or not you think this particular perspective is worth $34.99 is up to you. Stein, Joshua David and Julia Rothman. Brick: Who Found Herself in Architecture. New York: Phaidon Press, 2018. ISBN 978-0-7148-7631-3; Hardcover; US $16.95; CAN $21.95. A wonderful addition to a circulating juvenile collection and will be much loved as a storytime read-aloud. Stewart, Whitney and Stacy Peterson. 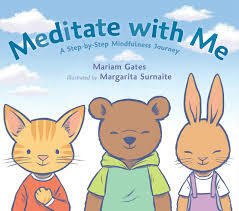 Mindful Me: Mindfulness and Meditation for Kids. Park Ridge, IL: Albert Whitman & Company, 2018. ISBN 978-0-8075-5144-8; Hardcover; US $16.99. ​I always get excited when I see a new yoga or meditation resource geared at middle school-age kids, because they really need it and there just isn't enough on the market for them. Like most books in this category, Mindful Me is a great attempt at meeting this need that misses the mark on delivery. The pastel cover illustrations, cutesy font, and abundance of heart and cloud motifs just feel so...canned and clichéd...that it makes it difficult to take the thoughtful prose and helpful exercises seriously. And while the inclusion of a few drawings of boys (including a wheelchair user) is an attempt to make the book more inclusive, the whole thing just screams "girly-girl!" There is no way my 11-year-old boy would take this book seriously, let alone read it in public. Which is a real shame, because there is a lot of good stuff in here, like how to challenge negative thinking, how to deal mindfully with electronic devices and cyber bullying, and how to interact with difficult social situations with kindness and self-care. Still a good addition to your juvenile non-fiction collection, just don't expect it to appeal to everyone. Meanwhile I'll still hold out hope for a more innovative design delivery on resources geared to preteens and teens.